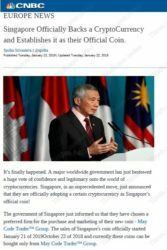 There are ads running and promoting the sale of a new cryptocurrency that has allegedly been approved by the government of Singapore. You can see fake CNBC articles with a message telling that you can buy this Singapore crypto from the May Code Trader Group. Everything is fake about the Singapore Official Coin. First of all, Singapore has not approved nor even planned a national cryptocurrency. In fact, despite numerous reports, no country in this world currently has a national cryptocurrency, nor is nearing its creation. May Code Trade Group is a just scam that will take your money and give you nothing back, since the Singapore official coin does not even exist. It is confirmed by the Monetary Authority of Singapore. We have already seen this type of scam with the fake Sweden national cryptocurrency, there also is a scam with the Swiss national crypto. We have to repeat, at this moment, there is not a single national cryptocurrency in the entire world! The Singapore National Cryptocurrency is a scam, no such thing exists, May Code Trader Group just want to steal your money. Stay away from them! There are only private cryptocurrencies. If you want to try trading them, you can do so on a free demo account with a regulated broker. However, always remember that in trading you can make, but also lose money, so be responsible.